Floating turbines could be the future of wind power. The Scottish government has approved the construction of the UK’s first ever floating wind farm, planned for the country’s northeastern coastline. A 30-megawatt (MW) pilot wind farm will be made up of five 6-MW turbines, which could power up to 20,000 homes. Because they are not attached to the sea bed itself, they are cheaper to make than traditional ocean-based turbines, reducing the cost of renewable energy. The turbines will be tethered to the seabed off of Peterhead, Aberdeenshire by a series of anchors, and cables will deliver power from the turbines to the shore. If successful, they will generate power at below £100/MWh ($155), compared with the global average of £112/MWh for offshore projects, according to the Carbon Trust, a consultant on carbon footprint reduction. Even larger floating wind farms could bring that cost down to as little as £85/MWh, the trust said. Because these wind farms don’t need to be attached to the sea bed, they may also be built on deep water sites in the future, something that would have been prohibitively expensive with traditional turbines. 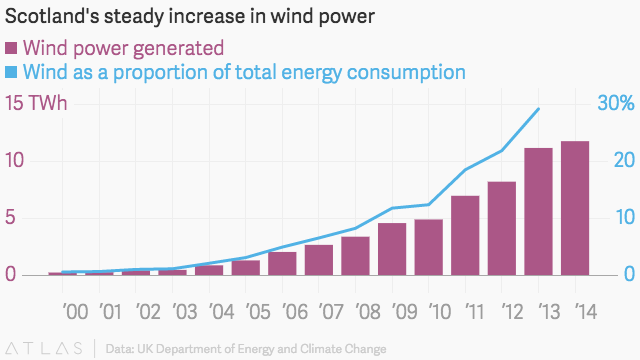 While Scotland’s wind energy production is high, there is plenty of room for improvement. Last year, Scotland’s total renewable energy generations was about 50% of energy consumption; neighboring Germany’s one-day record for renewable energy generation is 78% of the country’s power needs. On its best day yet, Denmark has hit 140%.